Adult Extra Strength features 60 billion CFU per capsule to support intestinal/gastrointestinal health. Beyond helping to support gastrointestinal health, it helps to promote a favorable gut flora and could help you feel healthy. 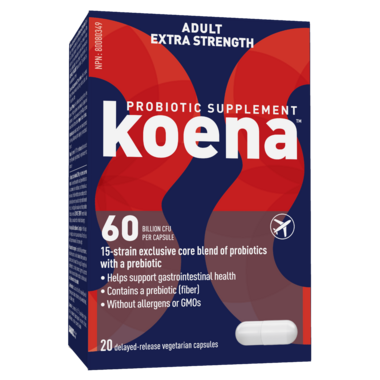 The extra strength core formulation features select blend of probiotic strains aiding in protection in critical moments, and includes a prebiotic (fiber) for optimal activation in the gastrointestinal tract. Dosage: Adults, adolescents 12 years and over - Take 1 oral capsule daily at any time, with or without a meal. If taking antiobiotics, take at least 2-3 hours before or after. WARNING: Consult a healthcare practitioner prior to use if you have fever, vomiting, bloody diarrhea or severe abdominal pain. If symptoms of digestive upset (e.g. diarrhea) occur, worsen, or persist beyond 3 days, discontinue use and consult a healthcare practitioner. Keep out of reach of children. Do not use this product if you have an immune-compromised condition (e.g. AIDS, lymphoma, patients undergoing long-term corticosteroid treatment).